Mark Hamill unleashes a fiendish cackle that simultaneously sounds like skin ripped from flesh and fingernails dragged across corrugated iron. If the bowels of hell have a soundtrack, this is it. But the actor’s descent into madness is only momentary and, for anyone who's played the Batman Arkham games, it is all too familiar. In rehearsing his role as the Joker, Hamill would laugh to himself in his car: a practice, he jokes, that wasn’t so unusual in Los Angeles. For anyone who thought his career remained exclusively in a galaxy far, far away with stuff like Star Wars: The Last Jedi, Hamill is having the last laugh. After first portraying Luke Skywalker in the original trilogy, the actor seemed to drop out of sight from the movie world for a while. But, outside of film and television, he’s been under our noses all this time, as a voice-over artist for dozens of video games like Arkham Asylum, Darksiders and Star Citizen. Beyond that, he was a mentor in Soldier of Fortune 2: Double Helix, a narrator in Call of Duty 2, and the titular hairy hero himself in X2: Wolverine's Revenge. While established actors usually dabble in games for contractual movie tie-ins, Hamill has embraced the genre wholeheartedly. Star Wars launched the career of Harrison Ford, but it sent Hamill (and his co-star Carrie Fisher) free-falling toward typecast hell. As his father was a captain in the US Navy, he spent much of his childhood on the move, so after Luke was left with the Ewoks in Return of the Jedi, he did what he’d always done: move on. By the time of gaming’s full motion video (FMV) craze in the mid-’90s, actors were eating their words. The titles may have been campier than a row of tents, but they were not short on talent, as Hamill discovered when he played Colonel Christopher Blair in three Wing Commander games. As he developed a parallel career in animation voiceover – becoming a cult star by playing the Joker in Batman: The Animated Series – he went on to play characters in games like Starsiege, relishing the challenges of interactive entertainment. In films, actors rarely explore every nuance of a character. In games, characters change depending on the player’s decisions. Some games, such as Full Throttle, even gave him a chance to play numerous roles. This was the only time Hamill acted on a LucasArts title. Considering the amount of Star Wars games released, has he intentionally resisted portraying Skywalker? “When I played Luke from 1977 to 1983, games were in their infancy,” he says. “I talked about turning a page and starting a new chapter. Those movies had a beginning, middle and end, and everyone sort of moved on." After Return of the Jedi, Hamill became known for portraying another icon, albeit one that’d have Skywalker quivering in his toga. Throughout the ’90s, he played the Joker in Batman: The Animated Series, reviving the role in various spin-offs, and for the 2001 game Batman: Vengeance. With Batman: Arkham Asylum, it was the return of the Animated Series’ Kevin Conroy (Bruce Wayne) and Arleen Sorkin (Harley Quinn), alongside the writing talent of Lost’s Paul Dini, which convinced him to sign up. “I thought this will be one last chance to play Joker. And it was so much fun to play a character who is clearly insane." It was a good call, too, Asylum went on to become a huge critical and commercial success, leading to two more sequels culminating with Batman: Arkham Knight in 2015. But what does Hamill think drives Batman's foe? 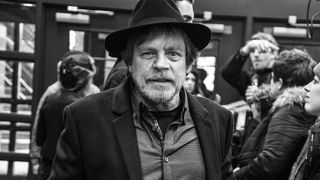 Having acted in film, TV, theater and animation, Hamill shows no sign of slowing down yet, even once you take Star Wars out of the equation. Currently enjoying his 66th birthday, the actor could have retired to bask in the glory of his cultural cache years ago, but his love of the job keeps him going. He laughs again, only this time not in the manner of a terrifying lunatic. Mark Hamill has appeared in over 30 video games to date, the majority of which include performances as the Joker, on top of a number of surprise cameos that might have slipped you by. Here, he recounts some of his highlights from a fruitful career in the games industry. “I love character parts because they are so far removed from yourself. When I played Amadeus or Joseph Merrick (aka 'The Elephant Man') on Broadway, I look in the mirror and feel Mark has receded and the character is there. I lean on the side of villainy for voiceover because they push the buttons of the audience and illicit emotions that make for a colourful story." “This is where Mark gets to be Steve Buscemi: a character sidekick to Tim Curry. Curry is a masterful actor. I saw him on stage when he did Rocky Horror at the Roxy Theatre on Sunset Boulevard. When I was listening to Tim's tracks, in my imagination I had a perfectly lit set, even though I was in a recording studio. To me that's what is so thrilling about voice-acting for games."